The Ancona chicken is a heritage breed. The reason for the label is because it came from Italy and was bred in England and then ended up in America in the late 1800s. These are a rare breed to find and are extremely desirable. -Anconas are great in the winter. 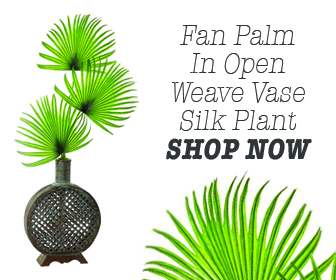 But it does not just stop there; they are also great in the summer! This is an amazing perk because whatever climate you will be keeping Ancona chickens in is one that they will thrive in. -They are stunning to look at. The Anconachicken breed has gorgeous, piercing eyes and beautiful black and white tipped feathers. You can spot these chickens a mile away. This type even comes in blue and red colors. If you want a bird to show off, this is the one to get. -As layers, the Ancona chicken should win a metal. They lay around 200 eggs in an average year, and these eggs are incredible quality. Furthermore, they don’t only lay when comfortable, no, they lay in the winter as well, which is an astonishing feat for a chicken. The winter does not even bother them, as we saw above! Not only do they lay well, but they do all other chicken duties without a single lazy bone in their bodies. -Ancona chickens are fun. They have a huge personality and are known for being happy most of the time. They are not dramatic, but instead, they get along well with the other chickens. Anconas are trusting and loving towards humans who care for them well. They show this by doing a whole lot of “talking”, as a perfect pet does! -The Ancona chicken will not eat you out of house and home. They are foragers, so that means your feed bill will be low and your pastures will be well taken care of. They like to snack on seeds, grains, and the most common, grass, meaning their feed consumption is low. They are fairly small chickens, but they produce so many eggs. It is a highly profitable situation all around! -Another reason you will love this breed is because of their ability to fly. 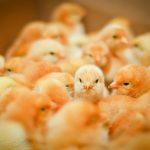 Though most owners steer clear of flighty chickens, this breed typically uses their flying abilities for a whole different purpose. This flight ability is precisely what protects them from predators. They are not looking for a chance to get away, but instead are alert and ready to defend themselves for any creature who threatens their existence. What Does an Ancona Chicken Look Like Exactly? I have gone into brief detail as to what the the Ancona chicken looks like above, specifically outlining their beauty, but I want to get a bit more in depth. This chicken breed has a distinct look, containing what some would consider a mottled appearance. It is all black, which is where the original name “Black Leghorns” comes from. On those black feathers are pure white tips. Every time there is a molting, the white tips grow in number. Another rare thing about the Ancona chicken is their ear lobes, which are white. In total opposite form, their legs are yellow. As for their comb, this can be either single or rose. One of the incredible things about this breed is that it is said to come in red colors as well as blue (as mentioned before), but these colors will always have the white tips. If you want to get specific, the eggs they produce are cloud white. The feathers on this breed are close to the body, which is said to be the reason they are so good in the winter weather. Overall, these are the type of chicken you would want to sign up for a contest at a fair. Their beauty is unsurpassed by other chickens. 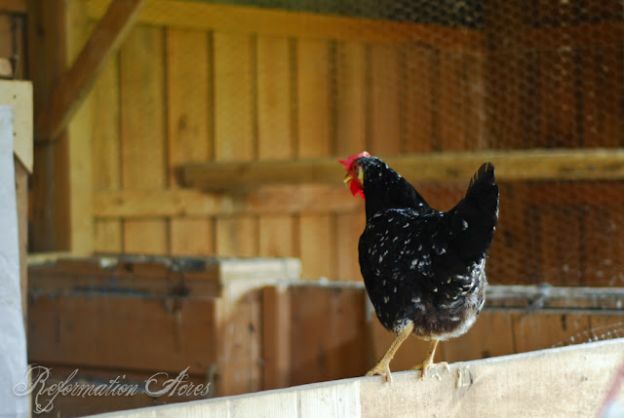 Our Ancona chicken is probably one of the most unusual laying hens in our flock. 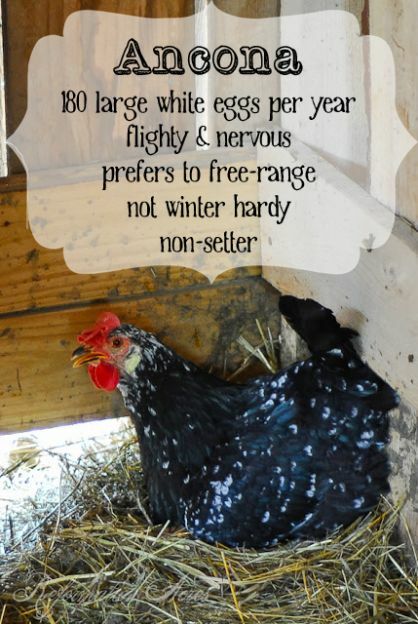 Her companions are comprised of Barred Rocks, Speckled Sussex, Australorps, and Golden Comets, and others are the typical birds you’ll find among a group of chickens. She came to be here when one year I let the children flip through a poultry catalogue and each could pick anyone they wanted. This was Lydia’s choice, and the sole survivor from that order as the rest fell victim to playful kittens. Personally, I think Ms. Ancona chicken is just fine with that situation. As it turns out Anconas chickens are loners. She’ll be in the general vicinity of the flock, but she doesn’t roost or eat with any of the others. She is very nervous, hates to be near people, and quickly runs away if you get too far inside her comfort zone. This nervousness has probably served her well over the years, not allowing predators too close. She doesn’t like it when other hens are in her comfort zone either and can’t tolerate being cooped up with the rest of the flock. 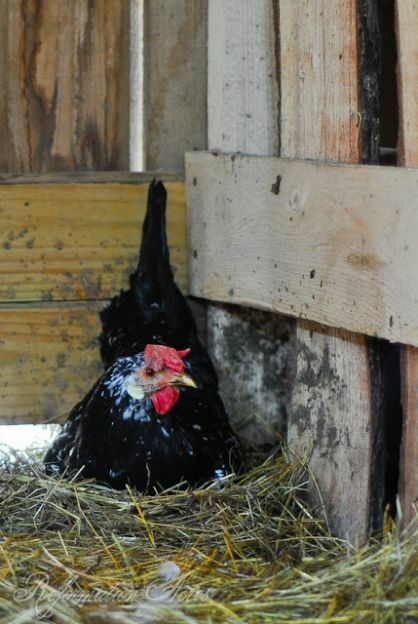 She will not roost in the coop, but instead finds a high corner or nook in the barn- which is also usually where she prefers to lay her eggs. If confined, she always manages to break an opening in the chicken wire bordering the top of the coop area and fly out. Even though, as our only white egg layer, I can always discern her eggs from the others, I feel I can’t vouch for whether the projected annual egg totals are at all accurate since so often we’re only gathering her eggs when a whole nest of them is found. Who knows if there are nests missing? This desire of hers to roam free and nervousness makes the Ancona chicken an excellent choice for a free-ranging bird; however, if yolk color is an indicator of a particular hen’s ranging abilities, her yolks are always more yellow rather than orange like the other eggs produced in my flock. I don’t know if this is a characteristic of the breed or an indicator that she isn’t foraging as well, getting enough of the nutrients that darken the yolk color. While our hen has never shown any sign of trouble in the winter, she is technically not considered winter hardy because the large floppy comb and wattles are more prone to frostbite. 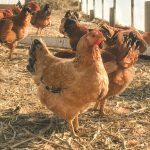 While on the one hand, it’s always nice to have friendly hens in your flock, the nervousness of the Ancona chicken and her preference to range makes her an excellent fit for a freely ranged flock, particularly if you are on small acreage living in close proximity to the chickens. The Ancona chicken isn’t one you’ll find hanging out on the deck or in the driveway, which to me is a TREMENDOUS bonus. 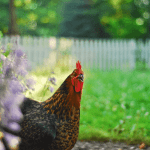 However, the difficulty of always having to find her eggs does offset this benefit since, after all, the eggs are the primary reason for raising chickens. Thankfully, for now, I have many little folks who are usually more than willing to go on egg hunts in exchange for a small fee. -They are very beautiful. 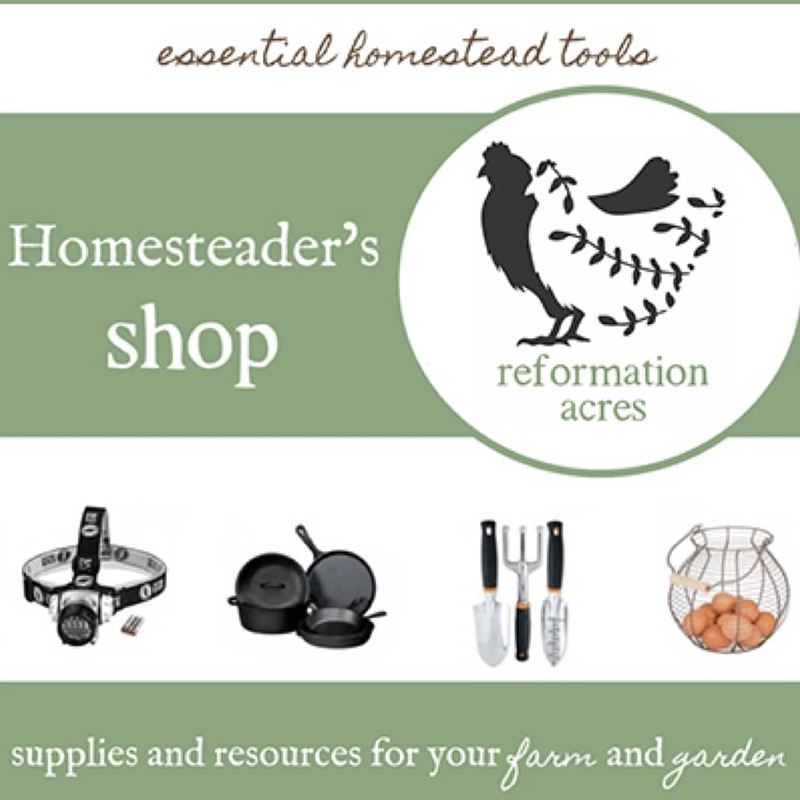 As we have explored above, these chickens are aesthetically pleasing to have on your homestead. If colorful feathers and beautiful bodies are important to you when purchasing your livestock, Ancona chickens are right for you! -Ancona’s are very active. They have tons of energy and are always doing something productive. 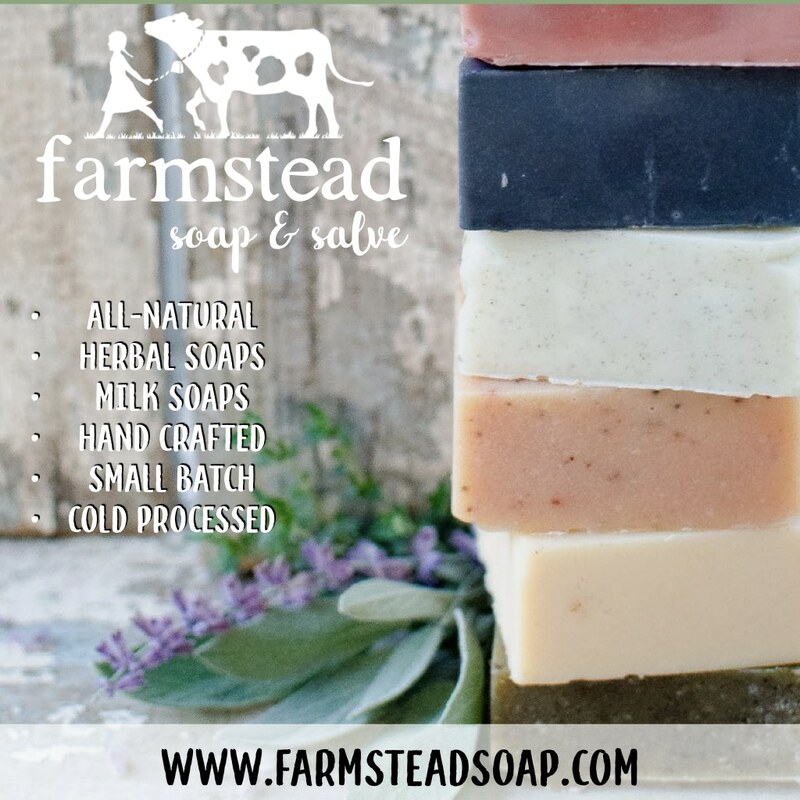 This breed adds so much to the quality of your homestead by foraging. -This breed matures quickly and becomes ready to get to work early on in life. -Ancona chickens are incredible layers. They lay tons of eggs regularly and have a very high count per year. They are desirable for their consistency, delicious eggs, and intention to lay regardless of weather. -This brings us to our next pro. They are good in cold weather and hot weather. What more could you ask for in a chicken breed? -These chickens are friendly. They love all humans, young and old, and grow close to their owners. If you are looking for more out of your livestock, like say, having pets, this is the breed to get. -Anconas have a great feed-to-eggs-ratio. This means the amount they eat and their production of eggs gets you the best bang for your buck. -You will need good, high fencing to make sure they don’t fly too far away. -They do not like to be confined. They are best as free-range birds who are given to the ability to run around as they please. 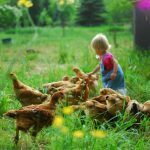 If you are not prepared to let your chickens roam and have this level of freedom, or if you don’t have space for it, don’t consider this breed. -Though most Ancona chickens only fly when there is danger nearby, coming with good wings gives the possibility of being flighty, depending on the specific bird’s personality. Some may be flighty, and this simply means you will need more protection. But as a rule, these are not flighty birds by nature, aside from self-preservation. -Some would say talkative and excited, others would say loud and annoying. These chickens can be obnoxious, and they are definitely a more conversational breed. This can be seen as a pro or a con depending on who judges it, but it is absolutely something to consider before purchasing Anconas. 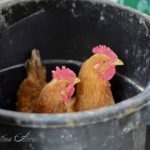 Have you ever raised Ancona hens in your laying flock? What are your thoughts on the breed? 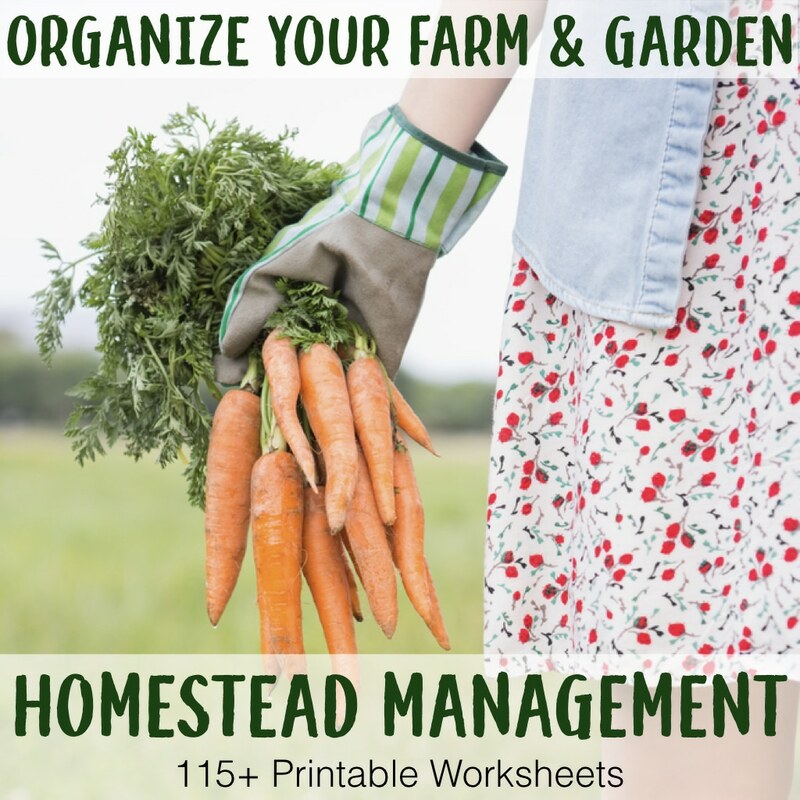 And if you’re in the garden a lot, she’ll have little use for being in there herself… could help with that issue too!